If you're both a powerpop fan and a fan of the alt-country band Old 97's like I am, no doubt you were disappointed by their last release, Drag It Up. It didn't have the insanely catchy melodies and jangle of Fight Songs (my favorite album of 1999) or Satellite Rides. Well, fret not. Frontman Rhett Miller has unleashed his inner power pop demon with a vengeance on his forthcoming album, The Believer, due in stores February 28. He's got Jon Brion on board to help out, and the album is already on my best-of list for 2006, as I've been fortunate enough to have an advance copy since around Christmas. Brion fans will notice the inclusion of "I Believe She's Lying", a track Jon wrote with Aimee Mann and which appeared on his 2000 release Meaningless. Rhett gives it a great reading here, but even better are some of his originals, including the opener "My Valentine", and the real standout, "Help Me Suzanne". 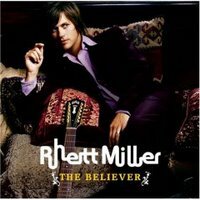 Interestingly enough, Miller revisits a couple of Old 97s tracks on The Believer. A new version of "Question" closes the album, and a remake of "Singular Girl" gets the song a proper release and exposure to a wider audience, as the original was a Satellite Rides b-side. "I Believe She's Lying", along with the "Singular Girl" remake, can be streamed in their entirety at Rhett's new myspace page, together with two other tracks from the album: "Delicate", and the gorgeous ballad "Brand New Way". Gentlemen (and ladies), mark your calendars for this one. I agree with the high placement of this disc on your chart.I was quite impressed with this collection and appreciate that background on some of the songs. I will have to dig out some of the older discs to hear the earlier versions. My wife also gave the seal of approval after i played the disc a couple times a few weeks back.This week she asked me what it was I was listening to 2 weeks ago Thursday at around 10 pm . I continue to utilize this site as a resource. Thanks for all your effort.